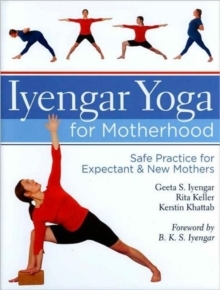 With its superb provenance, encyclopedic coverage, meticulous allopathic medical vetting, and more than 400 illustration-packed pages, "Iyengar Yoga for Motherhood" will become the must-have guide for every yoga instructor, mother-to-be, and new mum who wants to continue her practice. Lavishly produced, and with a fresh contemporary look that's easy to follow, it's broken up into trimesters with thorough explanations of what you can do and when, shown in 350 detailed photographs. Each spread features extensive instructions and hints, notes on the position's positive effects and contraindications, and advice on "checking yourself" for proper form and technique - a hallmark of the Iyengar style of yoga. Add to this a huge section on nutrition (with recipes), along with invaluable information on female physiology, and the result is a manual that no "yoga mother" should pass up!